Arriving In Israel, Obama Reaffirms An 'Unbreakable Bond' : The Two-Way During a two-day tour, President Obama will deliver a speech to students and visit Ramallah in the West Bank. Obama isn't in the region with a great plan to restart peace talks, instead he's expected to simply try to connect with the Israeli people. 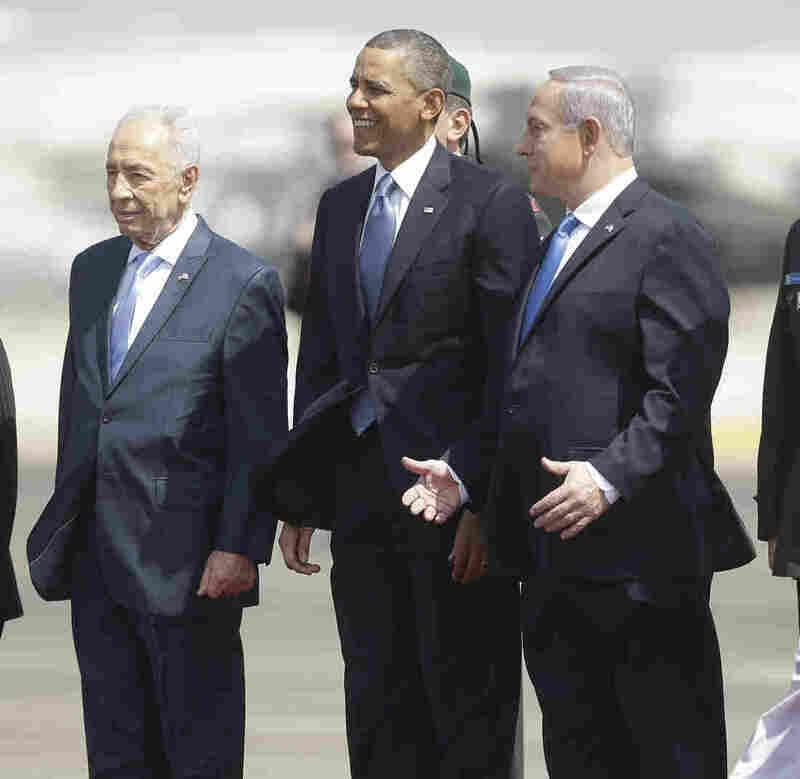 President Barack Obama is greeted by Israeli President Shimon Peres, left, and Israeli Prime Minister Benjamin Netanyahu upon his arrival ceremony at Ben Gurion International Airport in Tel Aviv, Israel, on Wednesday. Those leaders reaffirmed the "unbreakable alliance" between the countries, Larry said. "President Obama talked about the similarities between these two countries, how they both came from immigrants who wanted to be free who wanted to set up an independent democracy and to fight in order to do that," Larry said. Obama is now on his way to tour Israel's Iron Dome, the country's missile defense system, which the United States has helped fund. Later today, he'll head to Jerusalem and tomorrow, he'll cross into Ramallah in the West Bank. The New York Times reports that Obama does not arrive in the region with grand plans to revive stalled peace talks between Israelis and Palestinians. "Rather, he is seeking to make a connection with the Israeli people, many of whom view him with a jaundiced eye after four years in which he sparred with Mr. Netanyahu over issues like Iran and the Jewish settlements in the West Bank," the Times reports. The highlight of the trip will be a speech Obama will deliver to students at the Jerusalem International Convention Center on Thursday. The Washington Post reports the president is expected to reassure Israel of the United States' commitment to its security as Israel "seeks to counter threats from Iran and protect its people in the midst of civil war in neighboring Syria." Larry called this a "trust-building visit." He says that even though both sides insist there are no problems between the two countries, the fact is there has been some tension. "There have been questions about whether or not the Israelis are a little too eager to possibly attack Iran in order to keep it from getting a nuclear bomb. And there are also questions about whether or not Israel is serious about resuming peace talks with the Palestinians, but nobody is really expecting any big initiatives by the United States or the Israelis on those two fronts at this point," Larry told our Newscast unit. President Obama and Israeli Prime Minister Benjamin Netanyahu just wrapped up a 45-minute press conference in which they addressed the peace process, Iran and Syria. President Obama was asked by NBC's Chuck Todd why peace talks stumbled during his first term. Obama said that going into his presidency he did not promise to bring peace to the Middle East, instead, he said, he would start on the process immediately. But the bottom line, he said, is that "this is not easy." Netanyahu was asked directly whether Israel and the United States believed that Iran was a year away from producing a nuclear weapon. Netanyahu said the countries "share information and we share the same assessment on the schedule." President Obama said that "each country has to make its own decision" when it comes to war. But he believed that on the question of Iran, there was "still time to solve this diplomatically." On Syria, President Obama defended the United States, saying it has done a lot to try to bring the conflict to a resolution. "I have made clear the use of chemical weapons is a game changer," Obama said. His team, he added, is currently trying to assess whether the Syrian government has used those weapons. "Having the facts before you act is important when it comes to war and peace," Obama said. "Israel will have no greater friend than the United States," President Obama said during an appearance with Israeli President Shimon Peres. Peres for his part told Obama that his vision of peace for the region can be accomplished. He said he believed Obama when he said, "peace is not only a wish but a possibility." "I fully support your vision," Peres said. Obama said the two met at Peres' presidential home and talked about the Arab Spring, Iran and the peace process. They opened their meeting with a planting ceremony. Obama brought Peres a magnolia tree from the White House garden. "This is the work of generations," Obama said about peace. He framed that quote with a story from the Talmud about Honi and the carob tree. The tree yields carobs 70 years after it's planted. So what's the point of planting one, if you may never eat its fruits, Honi asks a man. The man tells him that when he came into the world, his father and grandfathers had planted carob trees for him to enjoy. The man said he was planting carob trees for his children and grandchildren.